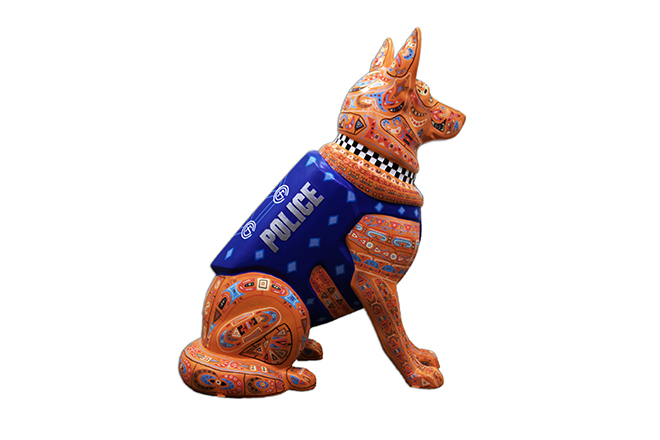 Early in 2017, a group of leaders from the Chicago Police Memorial Foundation and PAWS Chicago came together to launch a new public art installation campaign and fundraising initiative called K9s for Cops. The initiative serves to memorialize Chicago’s heroic fallen officers while supporting the families of police officers killed or catastrophically injured in the line of duty, while also honoring the 65 dogs who are part of the canine team helping Chicago police conduct building searches, detect narcotics and explosives, and track down suspects. 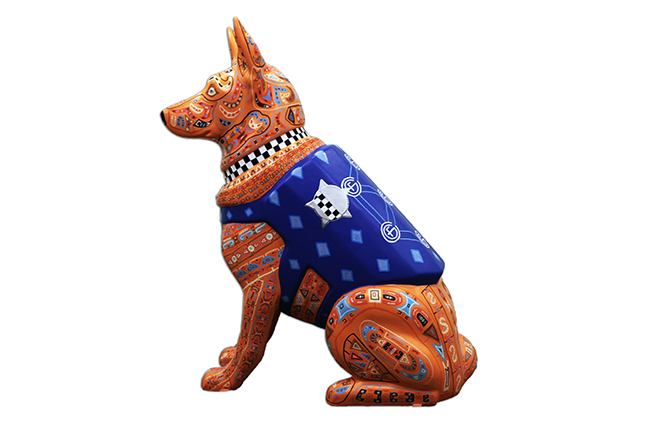 Artists are invited to team with a sponsor to paint iconic German Shepherd Statues molded so the the dogs are wearing a protective Chicago Police vest and PAWS Chicago collar tag. 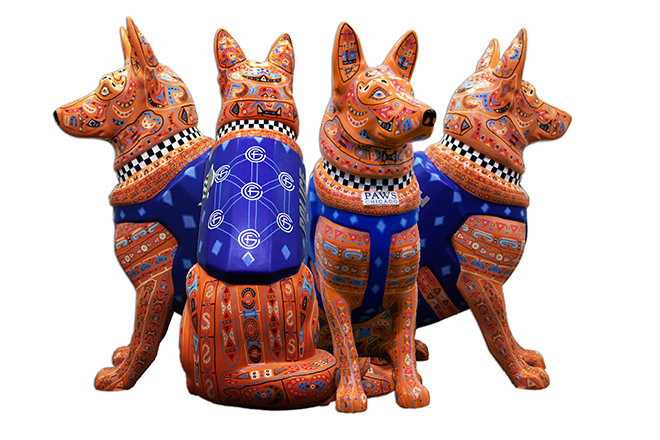 When complete, these statues will be on display along Chicago’s Magnificent Mile from July 23 through Labor Day, after which they will be auctioned off to raise funds for Chicago Police Memorial Foundation and PAWS Chicago. The Chicago Police Memorial Foundation will use the funds raised to provide financial assistance to families of slain officers, maintain the Gold Star Families Memorial and Park near Soldier Field, and purchase bullet-proof vests for police officers. PAWS Chicago will use the money raised to continue their work to provide residents in underserved communities with free spay/neuter services and medical care for their pets. The Gordon Flesch Company elected to participate as a sponsor and commissioned me to execute their statue. I worked to get all paint, primer and sealant donated for the project. I had some great discussions with Gordon Flesch’s Director of Marketing, Connie Dettman, about how best to approach the project. Connie shared the deep 60+ year history of the company, informing me how three generations of the Flesch family have helmed the company through the decades. She also stressed that while the company takes great pride in being family owned, that pride is checked by a commitment to their client base and the employees who work to move these valued relationships forever forward. Connie also walked me through the history of the Gordon Flesch Charitable Foundation, which unlike most corporate giving programs is managed entirely by company associates. Each year, associates nominate organizations close to their hearts and in their communities. The foundation’s board of directors then reviews nominations and selects award recipients. Grants are generally awarded to non-profits that assist people dealing with disease, illness or disaster. This spirit of charitable giving results in annual contributions to non-profits located in the communities where Gordon Flesch’s customers live, work and play. Since the foundation’s start in 2001 donations have exceeded more than $1 Million. After our discussions, I came away with the sense that the Gordon Flesch Company offers a wide “variety” of service and product offerings to their client base. Through their long history of “serving” their clients they have crafted a unique structured or “patterned” way to combine these offerings in a “guiding” manner. After they deliver the solutions to a customer’s needs they remain in a “sentry” like way to ensure everything works well through the partner “relationship”. The company is “standing” the test of “time” in approaching its seventh decade and doing so in a “noble” way via its commitment to give back via the Gordon Flesch Charitable Foundation. As I reviewed my notes I circled the words variety, patterned, guiding, serving, relationship, sentry, time, noble and searched for a way to bring these core foundational thoughts to my creative approach to the K9 statue. It struck me that the canines that serve on the police forces throughout the world are viewed with reverence as we humans all know these exceptional dogs are trained to do a lot of work that is dangerous. The dogs always perform the work in a willing, graceful and enthusiastic manner. When their task is complete they return to the side of their human counterpart standing ready for the next assignment in a regal manner. The bond between a police canine and a police officer is deep and one of great respect as the police officer knows the police canine will without question lay its life on the line for its human partner. As I circled and studied the provided blank K9, I noticed how the statue’s final rendering came off in a stately manner. 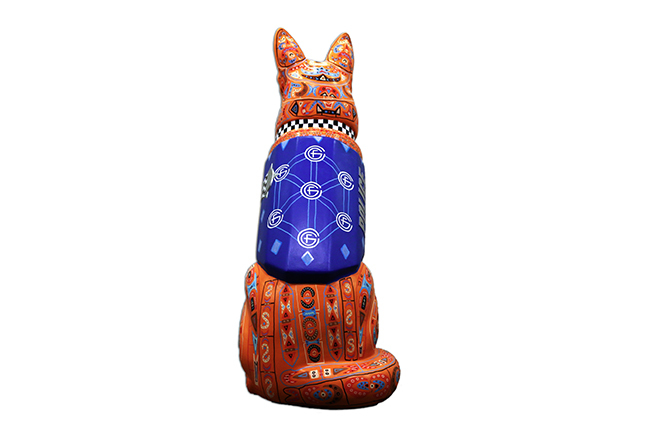 The early K9 statues executed by some of my fellow artists were done so in a realistic manner and I wanted my artistic approach to go in a different direction. 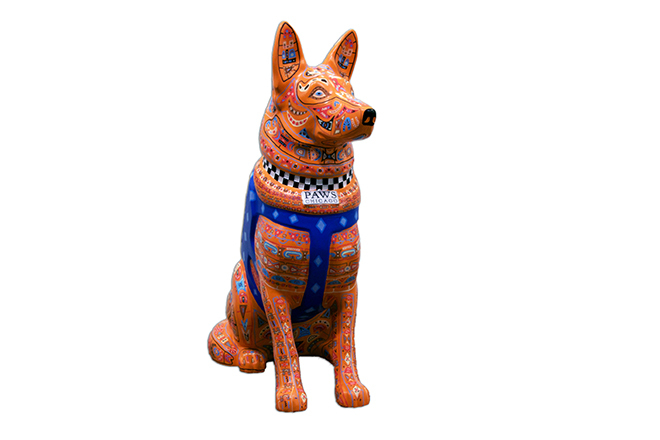 I began to link the K9 statue’s majestic pose with other works throughout history, as my mind went backwards through time I landed way back in the reign of Egyptian rulers and the elaborate tombs where they where laid to rest. These shrines were often “protected” by elaborate animal statues who were placed as guardians at the entrances and as eternal companions within. I shared my early concepts and thoughts with Connie at Gordon Flesch and she was supportive and trusting of my direction and let me set to task. In the end, I hope the Sphinx Shepherd comes across as a work that celebrates the way Gordon Flesch has served its valued clients and employees in their unique way through the years. More importantly, I hope the work acts as a bridge between Gordon Flesch’s commitment to charity for the communities they work in and the support they offer for those brave men, women and their noble canine partners whose job it is to serve and protect. After all, charity and service to others are two of the most noble acts of all. Finally, recently it was National Pup day and it was so lovely seeing everyone call out there four legged, furry and barky family members on social media. My family is super blessed with the companionship of our dog Tiki who was a stray that found us. If your family is feeling the call to add a pet to your home I suggest you visit your local shelter such as the excellent PAWS Chicago and explore adoption options. There are so many dogs just waiting for a forever home, trust me for every measure of love you give a dog it will be returned a hundred fold.